One of our borrowers recently paid off her loan (congratulations, Kivelyo!) and eight of our borrowers have been making payments on their loans, so we had funds available to us. Our options included having our loan money returned to us, or investing in the growth of another small business. The choice was easy for us. Our newest borrower is Reina from Columbia (pictured above). 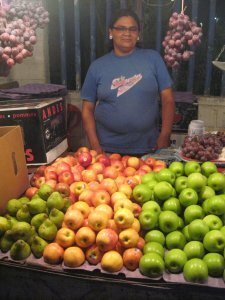 Reina has a fruit stand and wants to add more fruit to her inventory, as well as expand her business by selling multimedia such as CDs and DVDs. She has paid back two previous loans from Kiva and has been able to increase her profits and better her business, so she’s doing well and we hope to read positive results from her latest loan. If you’ve loaned money with Kiva before and haven’t been to their website in a while, or if you’re interested in learning more about Kiva, the organization has recently redesigned its website to make it more user friendly. It’s now very easy to find specific types of borrowers that appeal to you, by searching right from the home page. You can search by gender, country, business sector, whether it’s a group loan or individual loan, etc. Also, for the mobile technology lovers among us, Kiva has a gallery of apps created by third party developers.